Life. Life is so crazy. We look back at all the curves, twists and turns it took, and sometimes, we don’t even know how we arrived at the spot we currently sit in. Things can be blurry and fuzzy. I think it’s interesting how we often forget that it was our own choices that most often led us down the path we have found ourselves on. Good, or bad, those choices made dents in our life. They swayed us to the left or the right, bit by bit. And it’s why we are, where we are. Those tiny choices. Those choices we thought wouldn’t really matter in the big scheme of things. Those choices that we made when we were distracted, rushed, angry, or tired. Those choices we made when we decided we believed in ourselves despite what the rest of the world thought… or not. Maybe we agreed with the rest of the world and stopped fighting for our lives. Choices about who to let be a big part of our lives. Choices about how to spend our time. Choices that we thought wouldn’t matter, because no one else saw; no one else was looking. Choices that started to dictate our character, our worth, our value system, and our attitude. 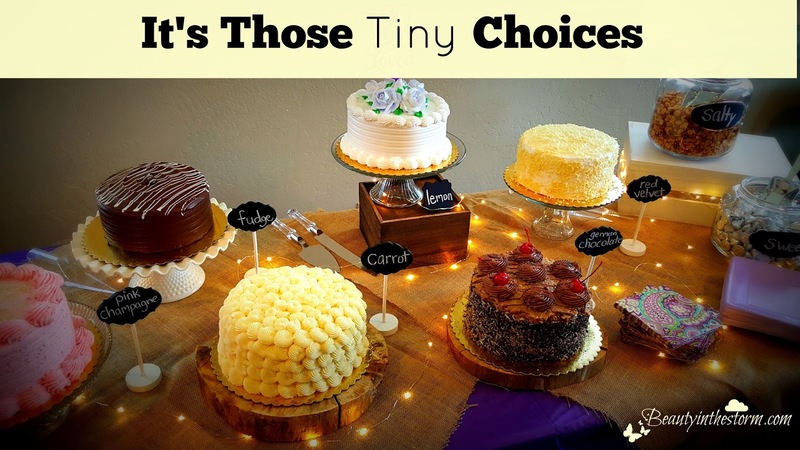 No choice is every really “tiny.” Not even buying a candy bar. For maybe you are trying not to have sugar, or trying to eat better. You give in once, you’ll give in again. Or maybe that candy bar is a treat. You decided to do something fun for yourself. And that one choice will lead you to start enjoying who you are more. Tiny choices always lead to bigger results. It’s why we need self discipline in our lives. It’s why we need to be intentional about who we are, where we are headed, and what we want to be about. We can look back at the road we’ve taken in life, and wonder how we ended up here. But it’s really not a mystery. It was all the choices we made along the way. The thing is… there are plenty more choices ahead of us. We can still sway the direction the path of our life takes. Whether our path goes through a desert, up over a mountain, or in a valley; our attitude and perspective can greatly dictate how we emerge from those times. Tiny choices. Choices that can impact our life (or someone close to us) in a good or bad way. Hmmm. That’s food for thought, isn’t it?